This carbonara recipe here is a Pinoy version of the famous carbonara. 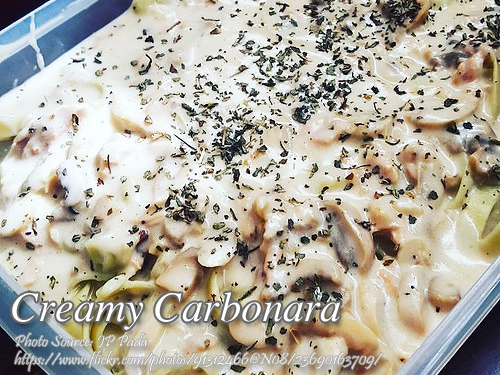 Instead of using beaten eggs and grated cheese to make the carbonara creamy, this version uses all-purpose cream, cream of mushroom and evaporated milk. This kind of carbonara is what most Pinoys love and is it suitable to our tropical climate since eggs easily spoil in warm temperature and you can’t keep it for hours. It is also the kind of pasta that you have to cook and serve immediately. Anyway, just for a sharing some info regarding the kind of cold cuts used in the recipe, the Italian version uses pancetta. Pancetta is an Italian bacon made from pork belly and salt cured and spiced, usually with black pepper. This kind of delicacy is expensive and hard to find locally than the ordinary bacon that we usually have in breakfast. So we just stick to the ordinary bacon. Cook the pasta as per package directions. Usually the instructions suggests adding cooking oil and few pinches of salt in the boiling water. If not indicated in the instructions, you can add cooking oil and salt to prevent the pasta from sticking together. Drain and set aside. In a medium size pan, heat butter and saute garlic and onion until the onions are soft and fragrant. Then add the sliced mushrooms and saute until all sides are seared and slightly brown. Then add the milk, cream of mushroom and all-purpose cream. Bring to a boil while stirring and simmer until the sauce thickens. Add in the fried bacon and season with salt, pepper and sugar. Add in also half of the parsley and grated cheese. Continue stirring until all the ingredients are mixed thoroughly. Turn off heat. Pour on the cooked pasta and garnish with the other half of chopped parsley and grated cheese.